By the time a baby is born, he or she already has 20 primary (or baby) teeth formed inside the gums. These teeth will start to come in when the baby is about six months old, and by age three most children will have a full set of primary teeth. Baby teeth will later be lost and replaced by permanent teeth, so why be concerned about baby teeth becoming decayed when they will be replaced? It’s simple – because a child who has caries (decay) in baby teeth is three times more likely to develop decay in the areas between his or her permanent teeth. Start oral care early. Wipe the baby’s gums with a clean gauze pad after every feeding. As soon as the first tooth appears, start brushing with water only. Wait until the child is at least two years old before using a pea-sized amount of toothpaste (and can spit out the toothpaste, not swallow it). Never allow a baby or toddler to fall asleep with a bottle containing milk, formula, fruit juice or any sweetened liquid, or a pacifier dipped in sugar or honey. Even diluted sweet drinks can be harmful and result in tooth decay. Infants should finish their bedtime or naptime bottle (or breast feeding) before being laid in bed. Encourage the child to drink from a regular cup by his or her first birthday. Discourage frequent use of a training (sippy) cup, as it can also contribute to “baby bottle” tooth decay. Schedule the child’s first dental visit by his or her first birthday. Think of it as a “healthy baby checkup) for teeth. Besides checking for tooth decay, your dentist will discuss other pediatric dentistry concerns like pacifier or thumb-sucking, fluoride needs, and common dental injuries and treatments. Care for your child’s baby teeth as if they are permanent teeth. Baby teeth hold the space needed for the permanent teeth. Parents often think “it’s only a baby tooth, why spend all of the time and money?” If a baby tooth is lost prematurely, many times the other teeth (both permanent and baby) will shift/move and create problems for the permanent teeth yet to come in. In particular, the first molars (6 year molars) will often tip forward if a primary molar is lost, causing spacing issues for the teeth around it. Share this information with others! In many households, parents rely on others to care for their baby at least part of the time. 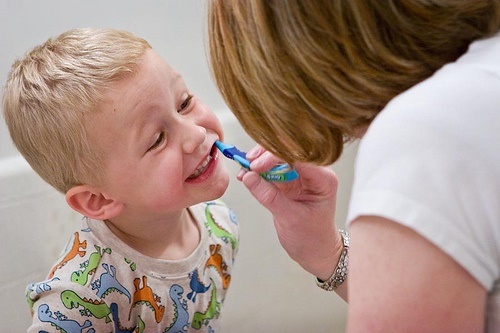 Educate all caregivers on children’s oral health – keeping your baby’s smile healthy is a team effort! Children learn healthy habits from their parents, and good oral health is an important part of a person’s overall health. Following these simple steps with your baby’s teeth will start him or her on a path to a healthy and beautiful smile! And when it’s time to schedule that first dental visit, look to Glen Oaks Dental for all your pediatric dentistry needs. The staff at Glen Oaks Dental will provide quality dental care in caring manner, and will work with you as a team to provide a great dental experience for your child.